Philadelphia Eagles quarterback Carson Wentz came out of the gates swinging, as his three first-quarter touchdowns helped the Eagles coast to a 34-7 win over the visiting Arizona Cardinals. Wentz torched the Cardinals’ secondary for 304 yards and a season-high four touchdowns against one interception. Third-year wide receiver Nelson Agholor led the Eagles with four receptions for 94 yards and one touchdown. Cardinals veteran quarterback Carson Palmer, on the other hand, couldn’t push past the Eagles’ defense, especially with his ground game running cold. Arizona’s backfield totaled just 31 yards on 14 carries (2.2 yards per carry). Leading the Cardinals’ one-dimensional offense, Palmer connected on 28 of his 44 attempts for 291 yards and one touchdown. A near flawless display from Wentz, with the only blot on his copy book a couple of errant throws on the final drive of the first half that saw him first have an interception dropped, before turning it over on the next play. But in the grand scheme of things, minor gripes, and Wentz (who was ably protected, with pressure on just 10-of-35 drop backs), was able to make a number of big plays that the Cardinals never recovered from. 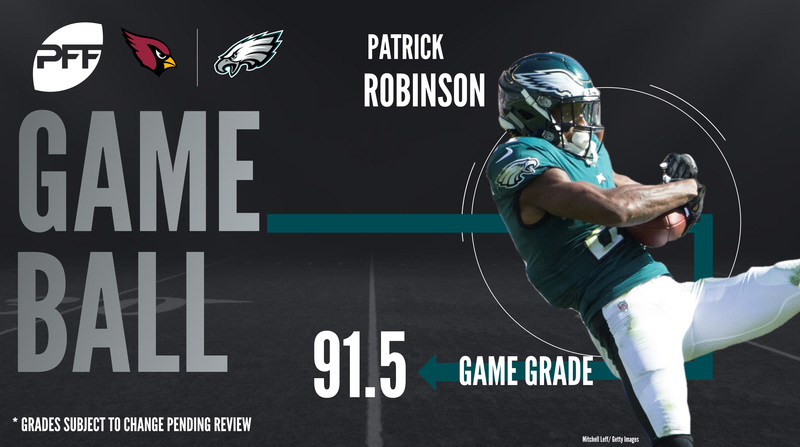 He ended the day with just five completions over 10 yards in the air, but his lofted pass to Nelson Agholor demonstrated just how devastating he is when moving the ball downfield. Another good performance from Johnson who turned his 33 snaps into the highest grade on the offensive line. The problem of course was the head injury that saw him leave the game and meant Halapoulivaati Vaitai entered the game. If Johnson is to miss time then Vatai is a guy we’ll be seeing more of, so it was heartening for Eagles fans to see his performance go largely unnoticed (in a good way). He ended the day with no hurries allowed and a 71.7 grade. Just imagined what this grade would be if Robinson could catch? Carson Palmer kept testing Robinson, and the former Saint and Charger had no problem passing it. He was thrown at nine times, broke up three balls and surrendered just 80 yards (with the majority of those in garbage time). No Fletcher Cox, no problem. Jernigan was particulary disruptive in the first half where no body on the Cardinals interior could handle him. He finished with two tackles for a loss and was constantly disruptive. Well that wasn’t pretty. Palmer is playing like a man who knows the gig is up, throwing careless ball, after careless ball. There were spells where he looked like the Palmer of old, but all too often he was throwing balls that only Eagles defensive backs had a shot at. That he ended with zero picks is a minor miracle, with an incredible four balls that were either dropped, or saved by his wide receiver from being turned over. It was meant to be a springboard to launch the career of D.J. Humphries. Instead the switch of career left tackle (minus an odd spell as the world’s largest center) to the right side has been an example of how the two positions might sound similar, but can be very different obstacles. Veldheer was at worst solid last year, but his rough 2017 continued with Chris Long and Brandon Graham working over him. He ended up being beat for a sack and three hurries in a rough outing. Is Bucannon healthy? The undersized linebacker seemed to have a target on his chest for the Eagles linemen at times, and that makes two appearances since his return to the lineup where he has been off the pace. Nothing highlighted this quite like both the defensive pass interference penalty he gave up, and the dominating pancake Jason Peters delivered to him with 10:24 to go in quarter two. It wasn’t all bad for the Cardinals and a pair of defensive tackles did make the Eagles work around the line of scrimmage. On fewer snaps, Williams was slightly the better between him and Corey Peters, and while he only ended the day with two pressures and two defensive stops, it was his work the stat sheet doesn’t record that was eye-catching.